I am trying to change the icon associated with a.m4v file in Windows 7, but all I can find on the web is how to do this on a Mac. Is there a way to do it on a Windows 7 box? That's close to what I want to do, but I don't want to change the generic icon for all file associated with a particular extension, I want to change the icon for each individual file. For example. I have files test1.m4v, test2.m4v, test3.m4v, test4.wmv, test5.wmv, and test6.wmv. These .jpg files are specific to each of their files. I would like to have the .jpg pictures show up as the icon for each file they are associated to. Does that make sense? You could change the icon for only one file type, using file type manager, say the icon for m4v only. That is all m4v files will display the same icon. Somehow iTunes changes each movie icon, depending on which movie the file is. It's the same with .wmv files if you download a digital download in Windows media format. I figure if companies can assign a different icon for each file, then we should be able to change the icon for individual files as well. So, my example is that if I have an iTunes digital download for Toy Story and Peter Pan, then each .m4v file will have a separate icon. If I look at each file in Windows Explorer, each file has the movie cover as its icon. So, there has to be some place where that image is assigned to that file. That is what I am trying to find. Where is that set so that it can be set or changed. Does that make sense. Sorry if I am making this more confusing than it is. This would, of course, present problems if these file are accessed by other systems or copied onto other systems! Are you talking about thumbnails (for movie files)? That can be done from withing view option settings in Windows Explorer. While is it possible to set individual icons for things such as executable files (with the associated .ICO file, etc. ), it isn't possible for individual movie files. What you are seeing is a "preview" snapshot which is being displayed by Windows or the media player (ie. iTunes). This is specific to individual OSes, the media player, and the file format. It can't require new extensions, because again, using the digital download from iTunes, the movies have the exact same extension with different icons. aadih, not sure if icon is correct, but if I go into iTunes and view my files as "Large Icons", I see the cover of the specific movie, not a generic associated to the file. If this is a thumbnail, then they should say that I am viewing "Large Thumbnails" not icons, but it could be that they are not calling it by its real name. If it is a thumbnail, how would I associate a thumbnail to the file? I have created a movie file with extension .m4v, so when I browse Windows Explorer, I want to see my picture as the icon or thumbnail of the file. Display file icons on thumbnails will do what you want. (Views options in Windows Explorer). What is Views options? I am guessing I go into the View menu, but I don't see options there. I actually already have "Display file icon on thumbnails checked. Do I want to uncheck it? If that is the case and I need to set my image up as a thumbnail, how do I make a picture the thumbnail of a file? Experiment with your settings. No need for making any picture, etc., as far as I know. > Somehow iTunes changes each movie icon, depending on which movie the file is. It's the same with .wmv files if you download a digital download in Windows media format. I don't use iTunes, but my guess is that you're seeing the movie icon in iTunes, not in Windows Explorer. So it is not really the "icon" from a Windows file system perspective...it is simply an image in an app (in this case, iTunes). It is usually possible to change the icon of an individual EXE file with a resource editor (like ResEdit), but it is not possible to change the icon of an individual M4V or WMV file (and many others). > so when I browse Windows Explorer, I want to see my picture as the icon or thumbnail of the file. My videos have the icon or thumbnail, which I am guessing is from the first frame. It looks like the first frame, but if I look in Windows Explorer, and I look at the iTunes directory where my movies are stored, the individual movie files have an icon or thumbnail that is the same image as the DVD/Blu Ray cover. I know how to make my videos that are in iTunes show the cover of the DVD, but I haven't seen how to make it show up as the icon or thumbnail in Windows Explorer. I am working on what people have listed above, but so far nothing is working. > if I look in Windows Explorer, and I look at the iTunes directory where my movies are stored, the individual movie files have an icon or thumbnail that is the same image as the DVD/Blu Ray cover. What is the View setting in Windows Explorer when you're seeing this? Are thumbnails enabled or disabled? I see the exact same thing for the movies I have downloaded from iTunes, but for the movies I have created, it just shows the first frame of the movie. It doesn't show the picture I want to associate with it. I don't know how iTunes does it, but I want to associate my DVD cover to my movie, Just like the rest of my iTunes movies. In Windows Explorer, what is the View setting when you're looking at the iTunes files? Are thumbnails enabled or disabled? If you are referring to the View tab in Folder Options, the checkbox "Always show icons, never thumbnails" is NOT checked. I used to have "Display file icon on thumbnails" checked, but after a previous commend, I unchecked it. Does that answer your question? Which view option is set when you are able to see the cover art as the icon on a video file in Windows Explorer? I understand what you want to do, but I can't seem to find a program that allows you to edit the metadata of video files. Not sure if this helps, but you could put each file in it's own folder and give the folder the custom picture. Right click the folder, properties, customize tab, chose file, select desired picture, then click change icon, and restore defaults. Or, you could create a shortcut to the file and change the icon for the shortcut. You would need to crop the image so that it is square and then convert to ico format (I used http://www.icoconverter.com/). 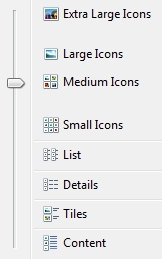 joewinograd, I have the view set to Large Icons, but pmitllc hit the nail on the head. Yes, that is what I want to do, but my issue is that I will likely have multiple video files in the same folder so I would prefer to not create more sub folders. I could do the shortcut, but if I do that, I have 2 icons for every video and i would likely have to keep the originals in one directory and the shortcuts in a different folder so that the videos don't appear to be duplicates. Hopefully someone out there knows how to do this. Anyone? You can set the actual video file to be hidden by right clicking, properties, and checking the hidden box. select "show hidden files, folders, and drives." Yes, I understand exactly what you want to do. I didn't even mention the shortcut approach because I was sure you wanted to do it on the video file itself (the M4V, WMV, et al. ), not on a shortcut. As I mentioned earlier, there are numerous tools that will do it for EXE files (and DLL files), but I don't know of one that will do it on video files. Thanks Joe! That worked perfectly! I really appreciate your help. Definitely a good find!....I'm going to use it as well.